(Click on the thumbnails below to access larger images. If you want to use these images in a presentation/publication, please cite the citation embedded in the image. 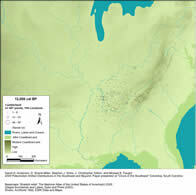 Total number of points reported in the sample, excluding all named Paleoindian and Early Archaic typed points save for Clovis, Ross County, and Clovis Variant. This is a measure of possible Clovis points, but perhaps more accurately refers to all untyped fluted forms that have not yet been unequivocally assigned to a later fluted type like Folsom, Barnes, etc. 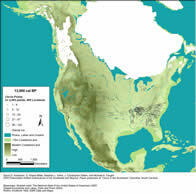 The SAMPLE number is larger than the sum of Clovis+ Ross County+Clovis variant plus all other named varieties, because in many surveys the fluted points were not typed, and hence could not be unequivocally assigned to Clovis. Image Source: Anderson et al. 2010:72. 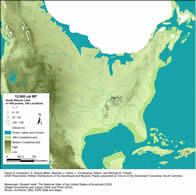 Image Source: Anderson et al. 2010:73. 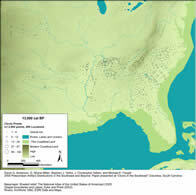 Clovis point incidence on four major lithic raw material categories in the lower Southeast. Most materials are found over areas several hundred kilometers in extent. 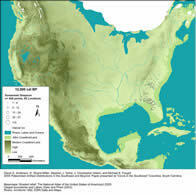 Image Source: Anderson et al. 2010:74. 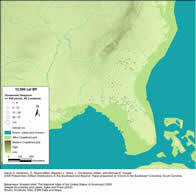 Cumberland, Redstone, and related ‘Full-Fluted’ horizon point incidence on four major lithic raw material categories in the lower Southeast. 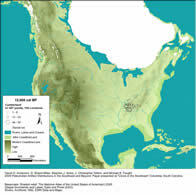 Most materials occur over areas that are smaller than those observed during preceding Clovis times. 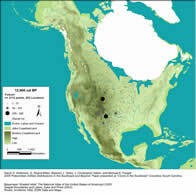 In most surveys, fluted projectile points are assumed to be Clovis and are represented here as 'Fluted' unless they are explicitly typed Clovis or some other variety is named, such as Folsom or Cumberland. Please note the sample at this time is VERY incomplete. 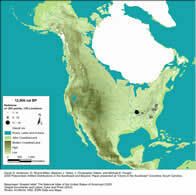 These two point types were represented together because of significant overlap in their ranges, as well as their demonstrated chronological contemporaneity at sites such as Dust Cave, AL (see Sherwood, et al. 2004). These two point types were represented together because of significant overlap in their ranges.